My heart skipped a beat when I first fully noticed her smile. This was not an ordinary smile; no, it was one encompassing pure joy and love. This was a smile that remained through physical pain and emotional suffering. This was a smile worth a thousand-word love story. This was the smile that completely changed my life. Before I could understand the beauty and meaning of her smile, my life seemed like a trap of suffering. I was selfish and unsatisfied. I was living for the good of myself and rarely considered others’ feelings. My week could have been ruined by the smallest, annoying sting of a tiny papercut, a “gross” meal, or a small humiliation. I cried whenever I lost a game or saw someone else receive more attention than I did. My heart hungered to find a purpose and meaning to life. And, although I did not realize my unhappiness at the time, I look back and see that I failed to recognize the dignity endowed to me by God at the moment when I was created. If I could not see the beauty in my own life, how could I see the beauty in the lives of others? But then, from the background of my busy home, I began to notice the impact of her smile. I curiously watched as people came from across the country just to see her life-changing smile. Their faces lit up as they held her and stayed in her presence. Strangers would approach our family and tell my parents how precious she was. Poems were composed about her—her joy and her influence. As I observed in the background, I began to ponder and realize what this smile meant to me. 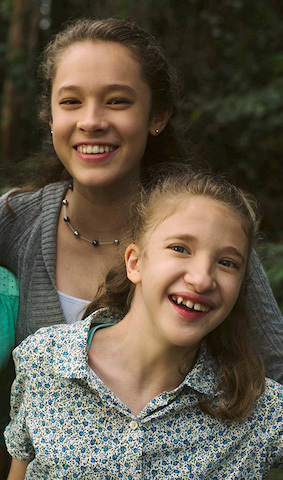 My sister with special needs was changing the world by her example of joy through her sufferings. I began to watch this most beautiful, selfless, and perseverant girl find her joy. I watched as she struggled to take each breath, suffering the physical stresses of having holes in her tiny heart. I watched her fight the pain in her throat as she learned how to chew and swallow, aspiring to have her feeding tube removed. I watched as she wrestled with the orthoses that wrapped her feet and ankles as she tried to balance and take a step forward. Yet, through all of this, I watched as she smiled every day—not because she was always free of affliction, but because she was filled with joy. My sister, five years my younger, was conquering her neurological and cardiological challenges and changing the lives of everyone around her. She practiced for 10 years before she could approximate her first “hi” or blow out the candles on her birthday cake; yet, she was able to bring overflowing love to others regardless of her ordeal. No physical challenge or obstacle ever stopped her. Instead of wallowing in her struggles like I had done, she accepted her sufferings as a gift from Christ and united them to His suffering on the cross. I realized that this precious, seemingly delicate girl, who is considered by many in this world to be a lesser person than I am, was a courageous model for me to follow. She demonstrates daily, with conviction, the inherent value of humanity and the appreciation for the gift of life. She smiles at the lonely, unnoticed, homeless man; waves cheerful greetings to the rushed grocery store cashier; and brings a smile to the face of the depressed and lonely widow. This little girl who cannot say the words “I love you,” who cannot bring food to her own mouth, and who cannot bathe herself, is able to overcome exterior obstacles and shine with interior beauty. Watching these acts of love has put a desire into my own heart. I want to be like her in the way that she changes lives. I want to be a light to those in darkness. I want to have an uplifting impact on others and smile through every struggle and trial. I want to stop living for myself. As I have accepted this challenge, I find myself finding peace in my life, and I delight in serving others. I recognize the beauty in every human life, whether in the sense of humor of a peer who is often shunned by her classmates or in the unacknowledged wisdom of a resident at a nursing home. Growing into a life of service is demanding; yet, as I strive to be the friend of the friendless and assist those in need, I continually remember the smile of my sister. Every day, I am inspired to be a woman of joy and laughter, whose love-centered character is what makes me most beautiful. My sister’s smile reminds me that every life has purpose. That smile is living proof of grace through the suffering of her cross. That smile is filled with contagious bliss and comfort. She promotes life by appreciating beauty in herself and in those around her; she shows, by example, that suffering can never destroy the God-given dignity of human life.